NORTH JUDSON, IN. 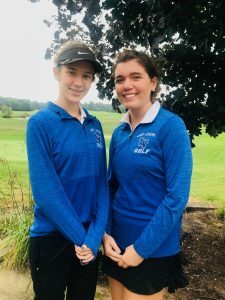 – The LaVille Girl’s Golf team participated in the Hoosier North Athletic Conference Championships at Chesapeake Run in North Judson, IN. Taylor Garrett picked a par and a bogey on her way to an 18-hole score of 131. Elizabeth Howard had a par on her way to a 133. Both Garrett and Howard finished in the Top 25 individually. Garrett and Howard will participate in the IHSAA state golf tournament Saturday, September 15. The event will tee at 9 a.m. at Knollwood Country Club – East Course.